This week we are posting an excerpt from our recently published EDRM Buyer’s Guide; a phase-by phase walkthrough and checklist created by a former Litigation Project Manager using guidelines developed during implementation of a top oil and gas company’s e-discovery program. The Guide is designed to help stakeholders evaluate software and workflow solutions at each phase of the e-discovery process in a neutral way and contains advisory sections on everything from information security to considerations when TIFFing documents. 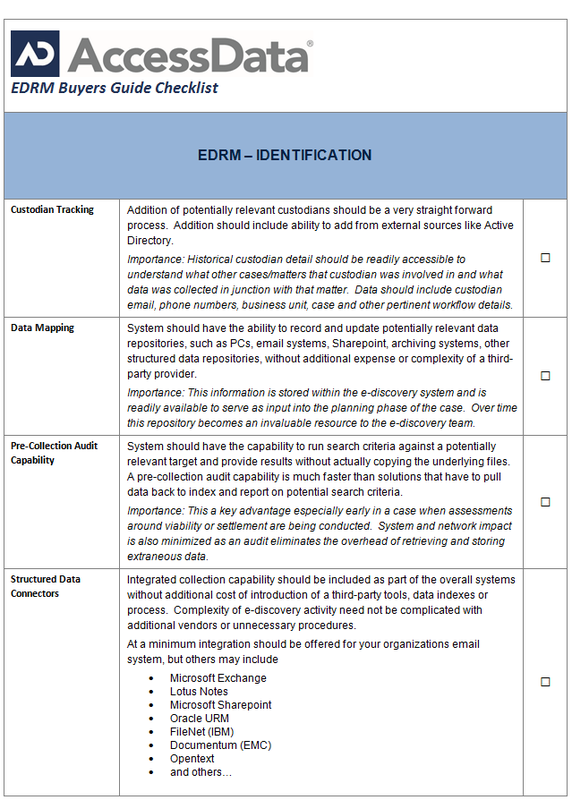 We will be posting excerpts from both the long form and checklist portions of the guide every few weeks – moving from left to right along the Electronic Data Reference Model [EDRM.NET]. This week we are focusing on EDRM Phase 1; “Identification” which includes development of a case plan, as well determination of sources for potentially relevant ESI. One of the essential parts of the identification phase is custodian tracking, because it helps organizations be proactive about where information resides and facilitates litigation preparedness. Historical custodian detail should be readily accessible to understand what other cases/matters a custodian was involved in and what data was collected in conjunction with that matter. Commonly stored data will include custodian email, phone numbers, business unit, case and other pertinent workflow details, which the system should be able to preserve and organize. Part of the system’s ability to track custodians should be supported by structured data connectors, which should integrate between the system and the firm’s existing programs. The Data Map may be the most crucial part of the Identification phase, because knowing where the data is and its accessibility level is intrinsic to planning the entire case strategy. Thus the data mapping functionality should be robust and should include the ability to record and update potentially relevant data repositories, such as PCs, email systems, SharePoint, archiving systems, other structured data repositories. It is essential that this functionality be built-in so that organizations do not have to incur the additional expense or complexity of using a third-party provider. Hand-in-hand with the Data Map is the pre-collection audit capability, which allows organizations to survey their information universe before they start the onerous work of collecting. Support for this functionality should include the capability to run search criteria against a potentially relevant target and provide results without actually copying the underlying files. The pre-collection audit option is preferable to solutions that have to pull data back to index and report on potential search criteria, because it is much faster. This can be a key advantage especially early in a case or when tight deadlines are approaching. Pre-collection auditing minimizes system and network impact and eliminates overhead, because it reduces the storage of extraneous data for early case assessment activities. The importance of the pre-collection auditing capability should not be understated because the practice will continue to grow in significance as organization data grows in size and complexity.